Most of us buy the same ingredients week in, week out, and cook the same old recipes. 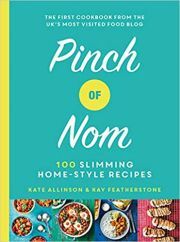 Cookery writer Claire Thomson wants to encourage people to ditch the boring chicken stir-fry, the all-too-predictable spag bol and dreary fish pie, and enliven their cooking and eating. Claire takes our 10 favourite supermarket ingredients and reinvents them as modern classics. With sections on chicken, tomatoes, eggs, cheese, minced meat, pasta, potatoes, salad, lemon and chocolate, each chapter covers the basics about that ingredient, then offers recipes using each in ways that will brighten up mealtimes. Claire's cooking is simple yet imaginative, and her kitchen expertise and knowledge of flavour combinations mean that these dishes will become your new standby meals. This is the new essential cookbook, a modern solution to the eternal question: "What shall I cook tonight?"